Every year, at least a week before the Greek’s birthday, I ask him what kind of cake he would like. More often than not, it is this stout cake with cream cheese frosting, but, in the almost seven years we have been together, deviations have been known to happen. The same can be said for most of the “traditions” we have developed together. They aren’t traditions in the firmest sense of the word, since we never quite know exactly what we will do with twenty pounds of apples after apple picking or what dishes will appear on our Thanksgiving and Easter table besides the obvious turkey and lamb. There have been times when we have tried to be “traditions people,” doing a set thing on a set day, but somehow it never works out. This year, however, might just buck that trend. In response to my question, the Greek asked for an ice cream cake, which was a bit of a throwback to the summer of my thirtieth and his twenty-eigth birthday when we threw a rather elaborate “three decades of dessert” party with cookies, a chocolate-strawberry ice cream cake and a raw chocolate avocado tart. But rather than give me any kind of direction as to the flavors and textures he wanted in this year’s ice cream cake, he told me to surprise him. While this did feel somewhat daunting (the pressure! ), I didn’t spend too long thinking about it. I don’t know if this can be attributed to the many summers I spent working in a Dairy Queen and the fact that I know the assembly of an ice cream cake like the back of my own hand, or to the fact that the idea for this very cake had long been germinating in my mind, ever since we made Aglaia Kremezi’s wonderful Halva Semifreddo for our Easter celebration last year. 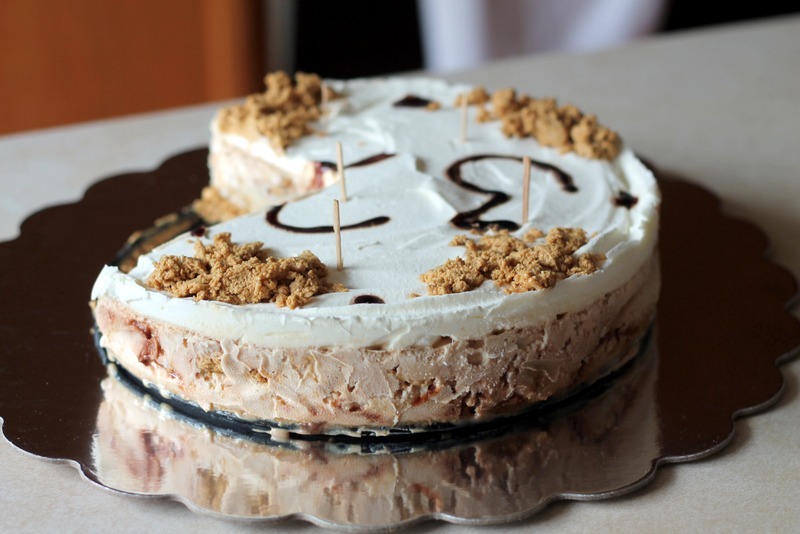 A traditional Dairy Queen ice cream cake usually has a base of chocolate cookie crumbs dipped in hot fudge, as well as two layers of ice cream, a center of chocolate-fudge crumbs and a topping of whipped cream. 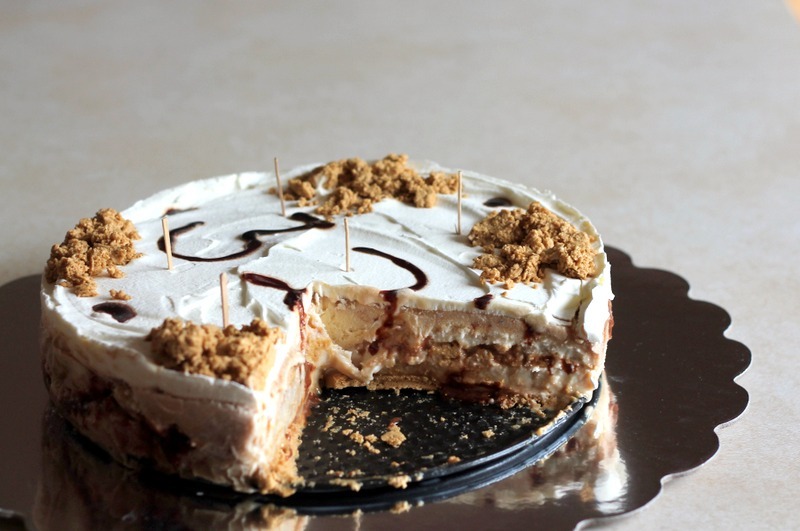 As I envisioned this cake, it would follow the standard pattern, but would have a base of halva, a crumbly, fudge-like candy made of tahini and sugar (or syrups), two layers of vanilla ice cream with swirls of date molasses and tahini, separated by a center filled with date molasses and crumbled halva, and unsweetened whipped cream on top with more crumbled halva for decoration. In a way, the end result would be a Greek ice cream cake–sesame, tahini and halva, although not always associated with Greek cuisine, appear frequently in Greek recipes, most likely due to either Byzantine or Ottoman influence; that said, halva’s origins are hotly contested–but with hints of the Middle East (recent presidential gaffes aside, Israel is obviously included!) in the date molasses (grape molasses, petimezi in Greek and pekmez in Turkish, seems to be more common in both Greece and Turkey). The only question was whether I could pull it all off and whether it would taste as good in reality as it did in my imagination. Tahini, simultaneously rich and bitter, is not for everybody; the Greek, while a fan, is not one to eat a tablespoon of either tahini or peanut butter like some people in this household who shall go unnamed. I also, despite copious internet research, couldn’t get a firm sense of how date molasses would freeze, so it all boiled down to the need, like so many things in life, just to wing it. My desire for perfection in all things aside, there really was no other way. If you’re wondering why this birthday cake seemed so important, it’s rather simple: not only is it a way of making a (birth)day just a little bit special, but it’s also something that can more or less be controlled, whereas the madness of the world–bombings, lies and all the constantly breaking news–cannot. In a year when world events seem to be moving down a trajectory that is anathema to you and checking the newspaper becomes an act filled with trepidation, you can’t help but focus more on small, seemingly insignificant things, which is perhaps also why this blog has so energetically come back to life of late. I know there are those who say that blogging or discussing food now seems impossible or tone deaf, but how we sustain ourselves seems more important than ever, both physically and mentally. After all, when living in an ceaselessly hateful and anxiety-fueled narrative, is there anything wrong with embracing escapist acts that demonstrate only affection? Needless to say, I think we all know the answer to that. 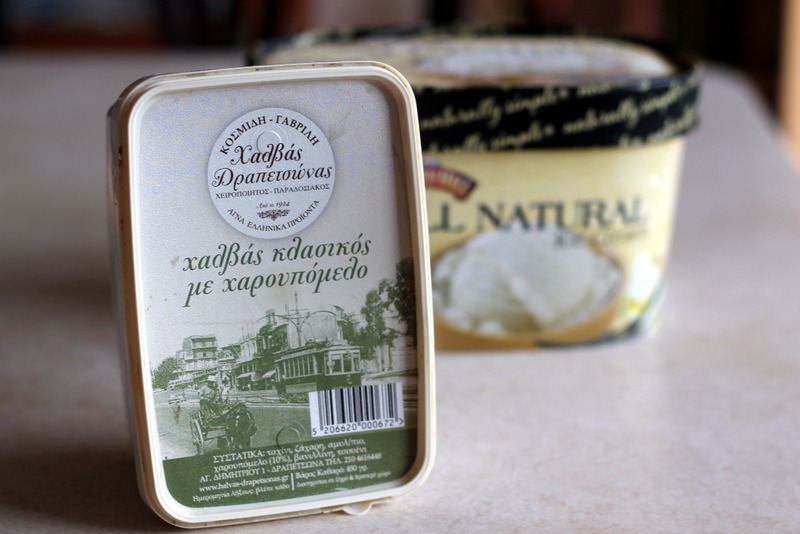 Some of these ingredients may not seem easily accessible, but if you are near a good Greek or Middle Eastern grocery store, you should be able to find both halva, preferably plain (the halva I used in this cake, which was purchased in Greece, was sweetened with carob syrup, but no matter–halva is halva. You could also, as Melissa Clark once did using a recipe in the Zahav cookbook, make your own) and date molasses. Believe me, if I could find this in Newark, Delaware, a place where we once had to buy naan instead of pita because of availability, you too can do this! As for tahini, it is widely available and you can use whichever brand–Joyva, Soom (my favorite), Whole Foods 365, Krinos–you like. Obviously, you want a tahini with flavor, but, since you are mixing it with date molasses and vanilla ice cream, you don’t have to use top shelf tahini for this cake. Beyond having all of the ingredients on hand, this is truly easy to make; it simply requires time and patience, as you have to let the ice cream soften, mix the tahini and date molasses in and then spread it on the cake. Also, one note about the halva, as it is rather oily, it should be fairly easy to press into the base of the springform pan; if you have trouble doing this with your hands (it can get messy), use a fork. Using a fork or your fingers, press the crumbled halva into the base of the springform pan. 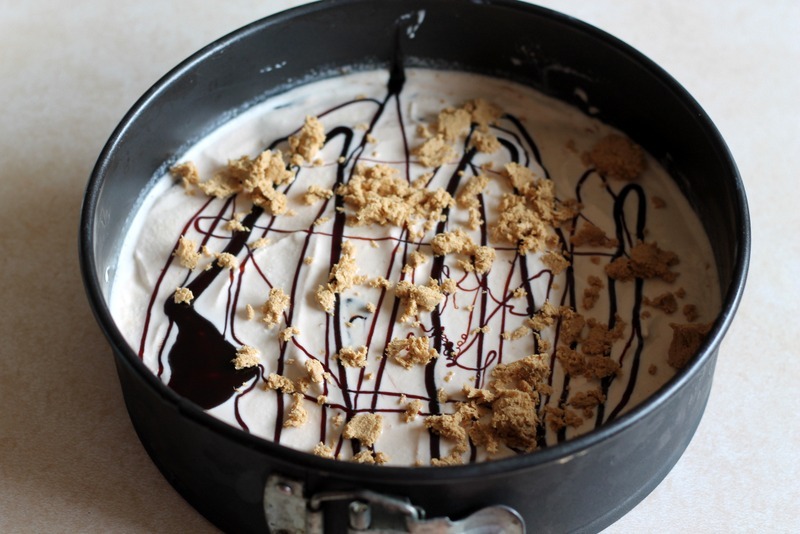 Place the pan in the freezer while the first quart of ice cream is softening on the counter. Cover the bottom half of a springform pan with plastic wrap (leaks are possible; this can be a sticky process, so best to be proactive). 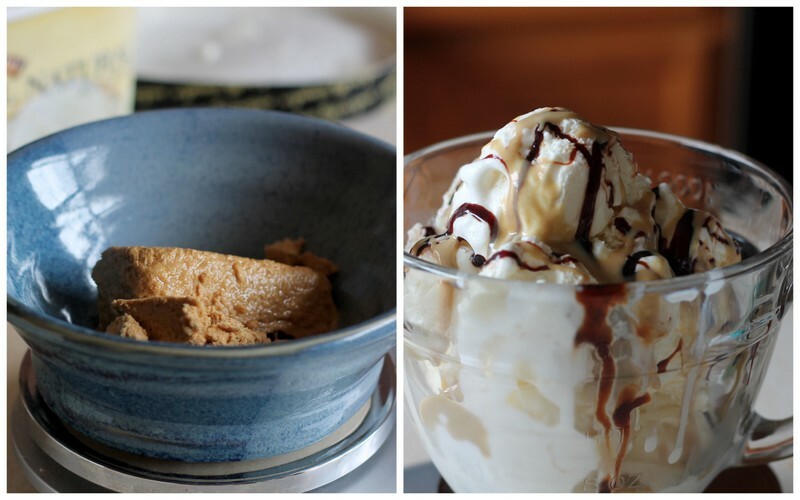 Measure out the ice cream and add one tablespoon of date molasses and two of the tahini. Mix together using a chopstick (the fine point helps to create swirls). Remove the springform pan from the freezer and, using a spatula, spread the softened ice cream onto the halva crust. Top with a drizzle of one tablespoon of date molasses; evenly sprinkle the 50 grams of halva over top. Cover with plastic wrap and freeze for at least thirty minutes before continuing to assemble. Remove the second quart of ice cream from the freezer. After thirty minutes have passed, mix the the remaining quart of ice cream with one tablespoon of date molasses and two of tahini. Remove the springform pan from the freezer and carefully spread the ice cream on top of the halva and date molasses center. Cover and place back in the freezer for at least 30 minutes. Using an offset spatula, spread the whipped cream over the top of the cake. At this point, you can either decorate the cake with crumbled halva and/or fill a pastry bag with one tablespoon of date molasses to write a message on the cake. At this point, you can cover and refreeze the cake or release the sides of the springform pan (run a knife around the edges, as the ice cream might have stuck) and serve. The cake can be frozen for up to 10 days; just be sure to refreeze the cake immediately after cutting into it. And be aware that the whipped cream, once frozen, will take on an icy texture. I’ve been meaning to comment on this dream-come-true recipe for several weeks now! 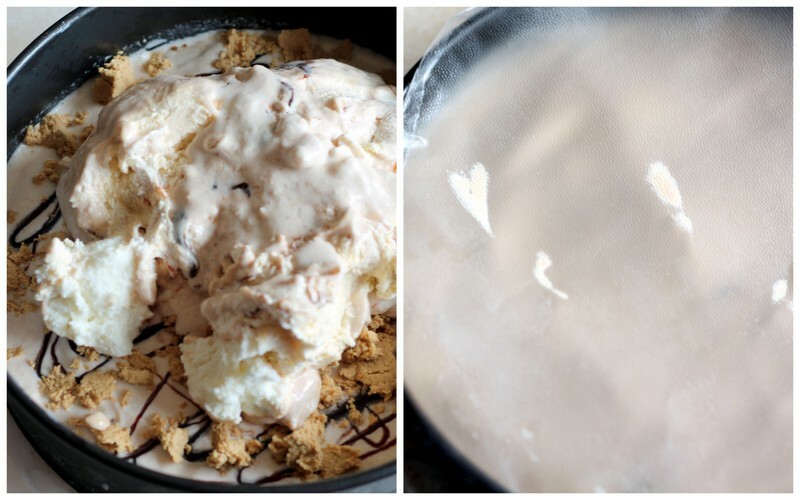 I have been a fan of halva since childhood (it was a special treat at Grandma’s house), and have long declared that ice cream is the hands-down best food in the world. And, when I was in NYC recently, I was able to get a sundae at Seed + Mill: soft serve goat milk ice cream drizzled with tahini and topped with crushed halva — so incredibly heavenly, and it immediately inspired new recipe testing to echo it in my kitchen. I think we’ve talked about the fact that I worked at Baskin Robbins in high school, where I also constructed ice cream cakes (I love having that similar background in common with you!). What a lucky man The Greek is to receive this act of affection amid all the deliciousness you provide! Thank you so much for your sweet comment! 🙂 The Greek is lucky, yes, although I had long been dreaming of this project, so his birthday was a just a good reason to make something sweet (I’ve been trying to cut back as of late…maybe after overdosing on baked goods in the fall when “Classic German Baking” came out). And, yes, I knew we were both “once upon a time ice cream workers!” It’s a nice bond to share and, really, despite the fact that I ate way too much cookie dough from the freezer while working at Dairy Queen and definitely gained a few pounds, not the worst job in the world…As an adult, I can safely say that most jobs should involve hidden troves of cookie dough. I remember seeing that sundae on Instagram; it looked so delicious! I was curious about the goat’s milk ice cream, though: did it taste overly of goat (I bought ricotta in the spring from a Whole Foods in Philly and it was made of goat’s–maybe sheep’s?–milk and I felt it had a bit of a gamey, musky flavor, but I seemed to be the only one who could taste it, so maybe it was just me?) or could you not even tell since there was halva and tahini?